When you are using The Pomodoro Technique® there is always a bit of a choice to make about your timer. I started out with a proper mechanical Tomato timer, I tried a phone app for Pomodoro, and I tried just the standard clock app. The mechanical timer had a couple of benefits… one of the original points about using this kind of timer is that it ticks audibly, which is a reminder that you are using the technique. It is also highly visible to your colleagues; so they know when you need some focus time. The downside was the noise. It was alarmingly loud for an office. A rubber-band adjustment made it quieter, but the cost of focus for me can’t be constant disruption for my team mates. The apps had the benefit of being quieter, but the loss of the ticking and the visibility to others was too high a price to pay. And that’s where my Oregon Scientific TW331 comes in. 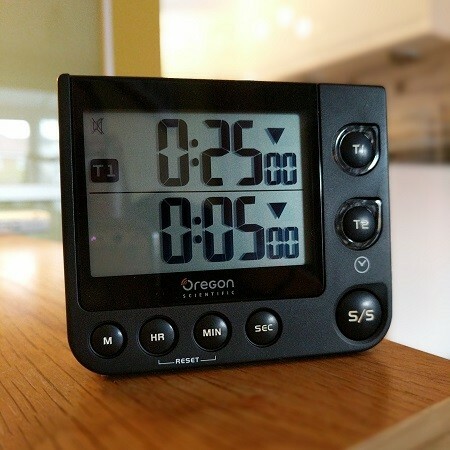 It has all the benefits of a visible timer, with some neat silent-mode tricks up it’s sleeve. Switching the alarm to silent results in the perfect Pomodoro mode. The timer has a visual green light that “ticks” while the timer is running and this changes to red when the timer has elapsed. That means it is a neat signal when you are in focus mode and it won’t irritate the people you have to share a fridge with. As an extra bonus, it has two timers; so you can have your 5 or 15 minute timer primed in T2 while the 25 minute countdown is running in T1. You can also use the memory function to remember your times, so you can push one button to reset T1 to 25 minutes, and the same for the T2 timer.